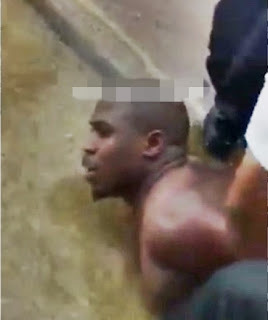 The gallant operatives of the Malaysian Police, on Saturday, arrested a mentally unsound Nigerian man after he allegedly submerged a girl’s head in a swimming pool at an apartment in Puchong, Selangor. According to a report by NST.com, some security guards at the apartment and other residents, became aware of the incident when they heard the victim, a girl aged about eight to 10, screaming for help, and immediately intervened and stopped the Nigerian man. A video at the pool side has made its round on the social media, believed to be the recording of the situation after the incident. The footage shows the Nigerian man clad only in shorts was heard shouting and muttering but the sentences were inaudible. A security guard was seen trying to control the situation. Subang Jaya district police chief, Assistant Commissioner Mohammad Azlin Sadari said police were notified by the security of the mentally unsound man creating chaos at the apartment’s common area. “A patrol car was deployed and the man in his 30s was arrested. He was taken to Puchong police station for questioning and later taken to Kuala Lumpur hospital on the same day,” he said. Azlin said no police report was lodged by the condominium management or the victim.